Through Mike Canuel and Kurt Erichsen, I learned about and was encouraged to join the UFO. This org of fanzine editors conducted its business in a monthly newsletter, to which the members were expected/required to contribute regularly. Although it later "expired" (during my chairmanship--I wasn't the greatest chairman ever), it has been revived and exists as of the time I've created this page. Without going at present into detail, I went out to the studio and grabbed up a mess of UFO stuff. I noted that I still have a set of folders for UFO Chairman business, a lot of loose sheets of printed material and a few back issues of Tetragrammaton Fragments!! from my tenure. There is also a box of what I imagine to be back issues from prior years. Then, over in a file cabinet where it should be is my set of back issues, some of which I got from Carl Gafford. At left is a copy of what may have been the first issue of TF!! I published. It is listed inside as "#73 (Vol. 5, #8), July 1979." So maybe it was the 8th I published. Further research is bound to turn up--something. 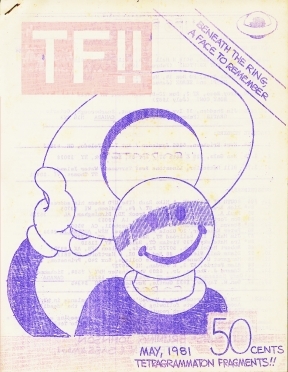 Although the original Blue Plaque Publications, which was the basis for the later UFO, was based on the thinking that ditto (blue) was the natural medium of fanzines, by the time of the UFO every method got used--sometimes in the same publication. Whether the rough below right (by me) wound up as ditto or offset or was ever used at all, or even ever rendered in finished art, I do not recall. Below is the self-cover of what might be the last issue I edited. If further digging brings up another story I'll get back here and edit. It is indeed in ditto, and for this site I've edited the scan to make it more legible. There were four active members, 3 inactive, and 14 subbers. HE'P! #5 (my minicomic) and TF!! 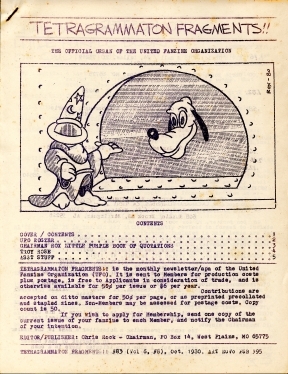 itself were the only member zines listed in the checklist. Okay. Stuff happens every day. Poking through the folders I dragged into the house to start this section from, I found this “un-numbered” issue of TF!! shown below (I tweaked the logo area as the copy at hand had a very weak red layer), and discover at my leisure it was #84. So maybe it’s the last issue I edited. Internal clues lead me to think so. The scoop on it is that it’s Vol. 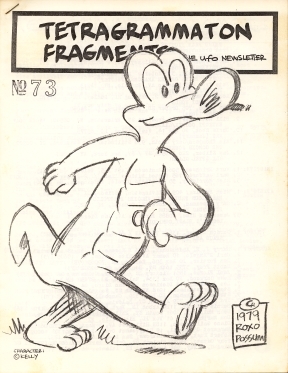 7, #1, May 1981. Therefore I deduce the volume numbers were going by chairman (I was the fifth chairman, and there must have been a sixth, then me again). There were 4 active members and 3 inactive. Account balances ranged from $0.00 to $1.74. There were 15 subbers--4 were receiving their last issue. And on page three was the last-minute addition of applicant Jim Main. My contribution notes that I imagined issues would become bimonthly for a time. I ran three photocopied pages from Comics Feature #2 by Jay Zilber, his piece titled “Trufan Confessions” on the BPP/UFO continuum and the flaws and demise of the UFO. Illos by Kurt Erichsen. There's plenty of room left on these pages, it's clear to me that the drama of the 1975-1980 UFO is a full narrative and probably instructive. 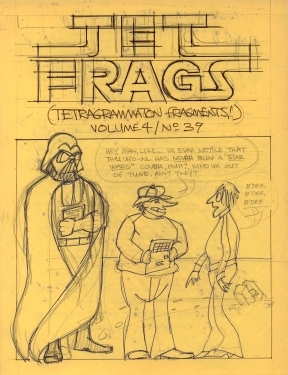 Looking at the few pieces I've dragged up and scanned (including some extra pages floating loose that have my arguments for and against a bunch of silly stuff that seemed important at the time) I wonder if there would be interest in it as general fan history, or for the present UFO to use as a reverse blueprint. If you reading this would like more, or more of a specific thing (including what went right and what went wrong with the UFO) be sure and e-mail me with requests or comments. I say this knowing I would not be the hero of the story. Any road, I will probably put together a cover gallery in future. I note Jay Zilber has many issues fully archived on Scribd. Entire site (c) Chris Ed Rock except as noted.